Here’s your regular roundup of what’s making South Leeds tick on other websites, blogs and across Facebook and Twitter. We start this week down in Hunslet where roads were closed to allow a steam train to cross. It was all part of the Middleton Railway’s Victorian Gala weekend. 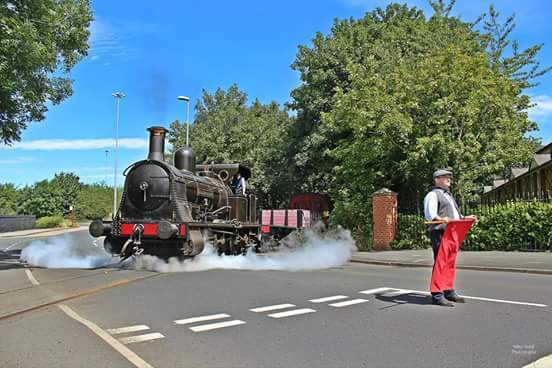 The photo, by Mike Hanable, shows visiting loco Bellerophon crossing Moor Road. There are lots more photos from the gala on Facebook. It’s gala time down at the Hunslet Club, were members and friends will be celebrating on Saturday (23 July) afternoon with inflatables, face painting and barbecue and a bar for the parents. Then you’ve just got time to get changed for their 1980s fancy dress disco, which will no doubt boogie late into the night. Alternatively, Leeds Corinthians are hosting their own gala, also on Saturday, at their ground near to Middleton Leisure Centre. Do you suffer from insomnia? Have you got a scooter? If so get along to The Works Skatepark on Saturday 30 July for their all-night scooter event. Don’t forget that throughout the school holidays, entry to the Works will be just £3 per day. If you’re going along to tonight’s Hunslet Warriors match against East Leeds (20 July), make sure you put into the collection for Richard Wheelhouse who injured his cruciate ligament against Thatto Heath and will be off work for quite some time. Beeston in Bloom received help from young people on the National Citizen Service and staff from LV to help them tidy up Cross Flatts Park ahead of Yorkshire in Bloom judging. Various groups including Cottingley in Bloom, Cross Flatts Park and Park Fisheries were being judged this week for Yorkshire in Bloom. We have to wait until 23 September to find out what they’ve won, but good luck to all of them. We reported last week about a raffle for Linus Harrison, this week thanks go to Lisa Sutcliffe and Gary Smith who raised an amazing £1,864 in a sponsored skydive. A few messages from the Inner South Community Policing Team: with the current hot weather remember to lock your doors and windows whilst you’re in the garden and don’t leave your dog in a hot car. They also have safety tips if you are playing Pokemon Go (no, me neither) and report an operation to stop shops selling alcohol to under 18s. And finally, there have been sightings of Cormorants and Herons as well as Swans down on the River Aire, spotted by residents of the H2010 development in Hunslet.